Waiting on Wednesday is a meme hosted over at Breaking the Spine. I love getting the chance to see upcoming books that I may not have noticed before. When her parents are murdered before her eyes, sixteen year-old Helen Cartwright finds herself launched into an underground London where a mysterious organization called the Dictata controls the balance of good and evil. Helen learns that she is one of three remaining angelic descendants charged with protecting the world’s past, present, and future. Unbeknownst to her, she has been trained her whole life to accept this responsibility. 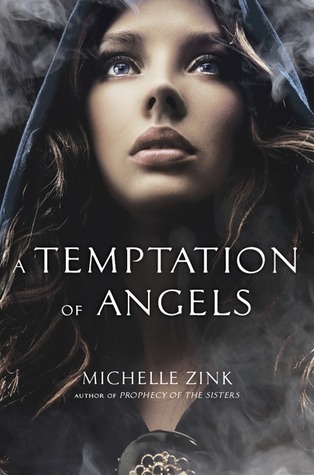 Now, as she finds herself torn between the angelic brothers protecting her and the devastatingly handsome childhood friend who wants to destroy her, she must prepare to be brave, to be hunted, and above all to be strong because temptation will be hard to resist, even for an angel. Today's book sounds fantastic! Have you heard of this book before? Read an advanced copy? What did you think? This is going straight on my TBR pile!, thanks for sharing :). I've read one too many fluffy angel books so I'm hesitant to read this one... My WOW this week has angels but they're badass! Sounds great! I can't wait for this. New follower! I have not heard of this one, but I read very little YA books. I do have to say it looks real interesting though and I absolutely adore the cover. Her eyes just draw you in. Great pick!